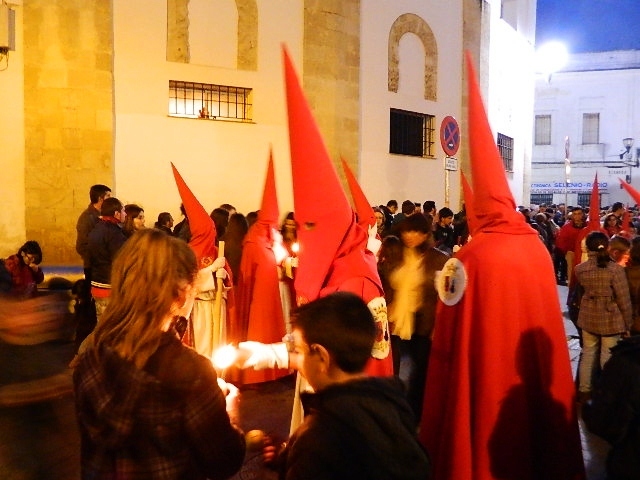 Holy Week (the week leading up to Easter), known in Spain as Semana Santa, is a very special time here. The population of Spain is 99 percent Catholic, and regardless of your religious affiliation, or lack thereof, watching a Semana Santa procession is an experience you will likely never forget. The people pictured below are members of one of many "brotherhood" organizations that represent different churches in the area. These brotherhood organizations are associations of Catholic laypersons who perform public acts of religious observance. 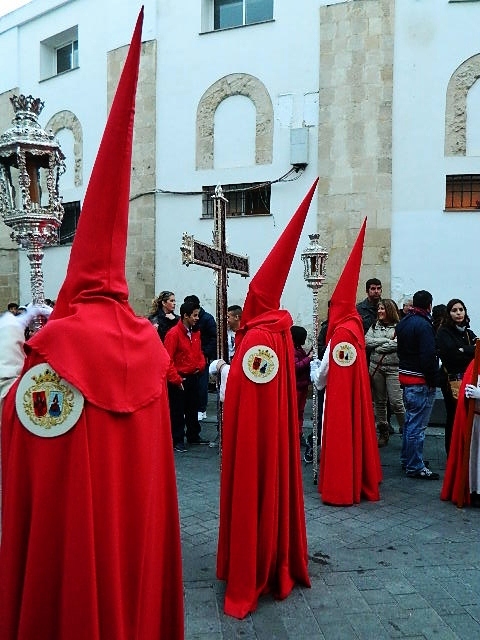 During Holy Week, the observances are related to the Passion and death of Jesus Christ and to performing public penance, and NOT, as one might glean from the hood, acts of hatred and prejudice. Hooded to signify mourning and a sign of shame for sins committed throughout the year. Massive "floats" carved from Mahogany weighing thousands of pounds and adorned with candles, giant crucifixes, and the Virgin Mary are literally carried through the streets. Because of the weight of the floats, processions through the streets take several hours. It is an honor to carry the float, and over the course of the procession, tired carriers are traded out for fresh ones so the procession can continue. Crowds gather along the streets in an atmosphere of excitement, anticipation, and reverence. Float (pic on top of page shows how floats are carried). When the procession stops so the men carrying the float can rest, children run out to the people of the brotherhood to have them drip wax on balls which they bring to the processions year after year. 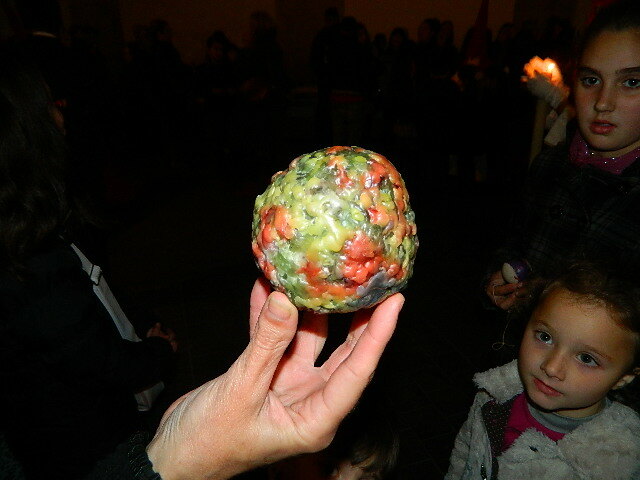 Over many years, the wax builds up and the ball gets larger and larger. 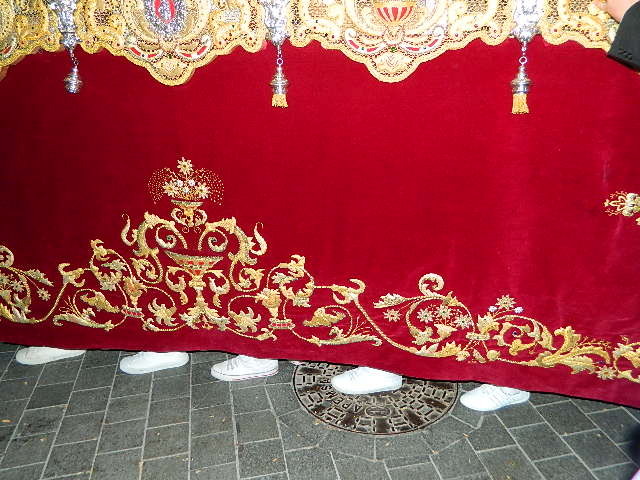 When Semana Santa is over, the streets are covered in wax drippings and special crews are brought in with street cleaners that use very hot water to remove the wax. The procession atmosphere is one of solemnity and reverence mixed with street fair and parade. Family members along the route try to spot loved ones in the procession, picking them out from all the other hooded participants. The floats are followed by brass bands, which you hear coming in the distance long before you see the procession, adding to the anticipation. There is much more I could say about Semana Santa, but it's one of those things that can't be adequately described...you have to experience it yourself!